The Saudi Arabian Mining Company (Ma’aden) announced that its affiliate the Ma’aden Phosphate Company (MPC) was recently awarded the 2017 International Safety Award from the British Safety Council. The award was received by MPC’s Director of Environment, Health and Safety, Mr. Musaad Al Garawi, during a ceremony in London on May 5th. MPC won the award as recognition of its outstanding ongoing efforts in recent years to prepare and implement health, safety and environment programs in accordance with best international practices and the directives of Ma’aden EHS standards. Annually, the British Safety Council invites its members and other organizations around the world to nominate a company or project for an International Safety Award. Now in its 60th year, the award recognizes commitment to good workplace health and safety management. More than 500 entries are received each year and are adjudicated by an independent panel of chartered health and safety professionals. 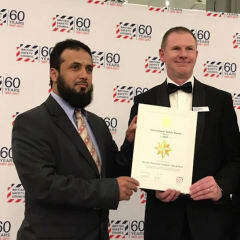 The British Safety Council Award marks another successful milestone for the Ma’aden Phosphate Company which has already received certification for ISO 50001 (Energy Management), ISO 9001 (Quality Management), ISO 140001 (Environmental Management) and OHSAS 18001 (Occupational Health and Safety). Ma'aden was formed by Royal Decree in 1997 to facilitate the development of Saudi Arabia's mineral resources. In 2004, the Cabinet adopted the new Mineral Investment Law in a step helped in the development of the mineral sector and the infrastructure of the railway and the port, which enabled Ma’aden to easily transfer its products to market.